"Who dares wins" is true only to the extent that it does not say everyone who dares wins. In a similar way, the oft-quoted Vince Lombardi, famed NFL coach, once said that "if winning isn’t everything, why do they keep the score?" But perhaps it would be more interesting to ask why those who get the highest score don’t always turn out to be the winners. The road is long...so it seems about time to reassess the achievements of a band from a small Welsh town who could by now be rich and famous, but for the fact that they fell apart before they could deliver on the promise of their self-titled debut album***. 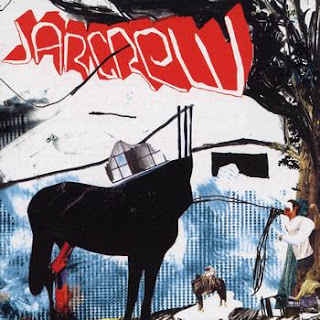 'Jarcrew' by Jarcrew is a mighty gem of an album – a viewpoint recently endorsed in the NME's 100 lost albums feature, although I don’t accept the view that Jarcrew failed because they were ahead of their time. Many people at the time appreciated both the album and their live performances (even our esteemed editor – evidently a man of Catholic tastes - bought and enjoyed the album), but the band couldn’t hold it together long enough to reach a larger audience. So how does it stand up now? Better than the other 99 lost NME albums is the short, somewhat biased, answer, but that is faint praise. It still sounds fresh seven years later and the mix of punk and math-rock sensibilities – best exemplified on opener 'Moneyshot' and 'Paris & the New Math', with its pervasive chorus - seems amazingly prescient in hindsight. Tame Impala’s recent album 'Innerspeaker', for example, feels like a closely related cousin, and the album closes at least as strongly as it opens with 'Capobaby', 'Quiet It Is....Dead' and 'Sad French Death Metal' (hang in there for the last 30 seconds) - all really entertaining songs, perhaps dated only by the guitar sound. The lesson I take from rediscovering this album is that experience, and musical experience in particular, should be judged in the here and now, because if it is a contest then too often it’s "wanker takes all". So listen to Jarcrew without a thought to what happened next and enjoy it for what it is, a really fine album. *** - technically, it was their second album but was a remixed, re-released version of their debut proper, 'Breakdance Euphoria Kids'. Search for 'Jarcrew' in your local record shop's bargain bin or download the mp3s from Amazon.co.uk.